After the recent scare with Pip’s bellyache, I decided that occasionally giving the boys their goat minerals wasn’t enough. They needed a feeder. 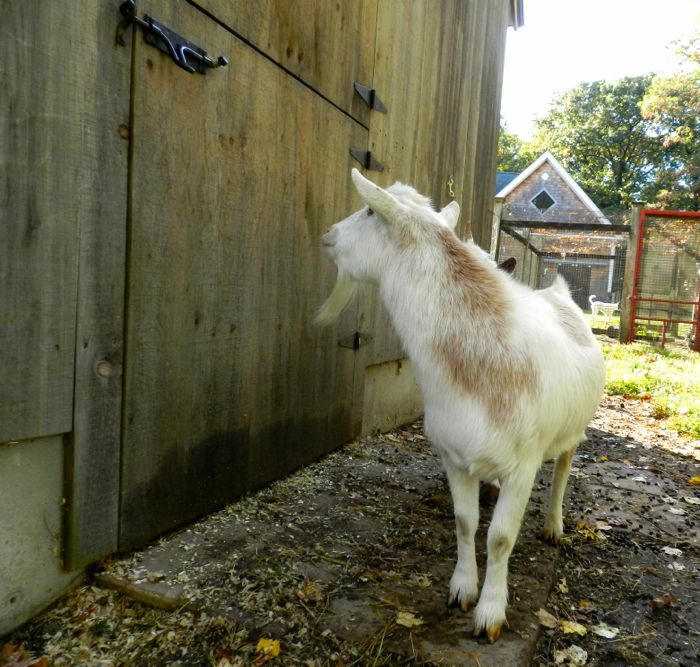 There’s not a lot of goats around here and the feed stores don’t carry sturdy goat-proof dispensers. So, I found this plan online, and Steve built it. The goats offered their assistance with the installation. so the goats were asked to wait outside. 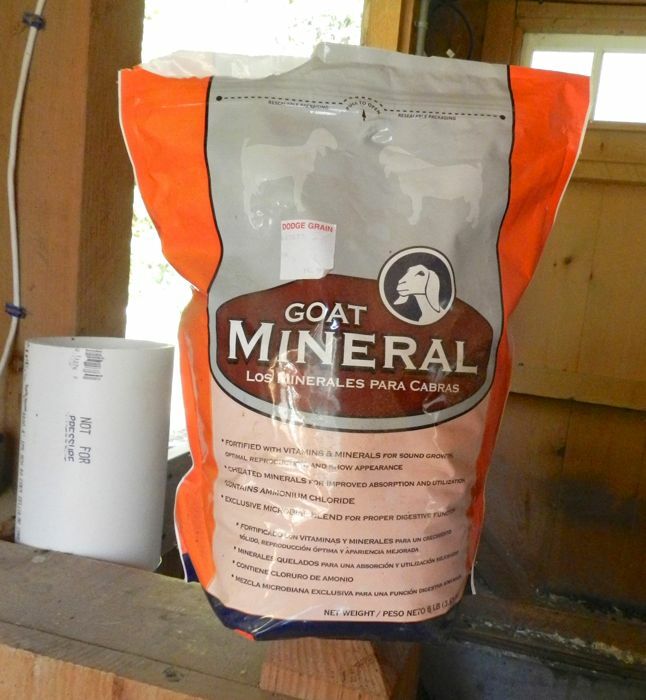 Minerals, designed especially for goats, are essential for their health. 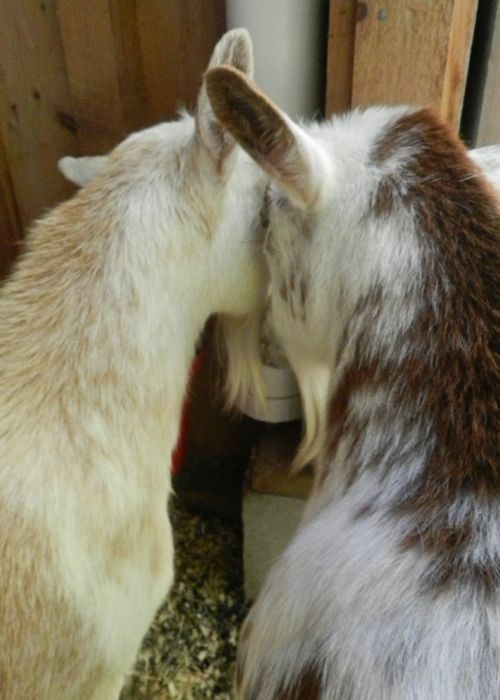 I poured the mineral into the feeder and let the goats back into the stall. The goat boys were beyond thrilled. They licked, they chewed, they crunched. Supposedly, this design keeps the minerals clean and the goats from being wasteful. Only one nose fits at a time. There was some shoving, but both boys ate plenty. I was concerned that perhaps they were eating too much. I wrote to the experienced goat maid at Cudzoo Farm who reassured me that goats go NUTSO (her exact word) over minerals and not to worry. She also told me that the boys should also be getting kelp in a separate feeder. So, Steve will be making another run to Home Depot for more PVC pipe. I also asked Pip and Caper’s breeder at Village Haven Farm for advice, and Martha reminded me that goats need baking soda, too. Anyone at Arm & Hammer reading this? I think that I have your next spokesgoats. Cheering up a dismal day is exactly why I have goats. Am happy to share. They have plenty of happy for everyone! Pip looking at the door in such a forlorn way. That is very interesting, about the kelp. I remember the farmer next door putting out mineral blocks for his cows, goats, horses and sheep on their farm. Your husband is quite the Guy Friday. I must say it again, your goat boys are so adorable. Thank you for the great photos Terry. There’s a lot of fermentation going on in goat bellies, and that helps keep things right. So, self serve baking soda… or sort of sprinkled over other food? I am learning so much more from your posts than any of the books I read! Thanks, Jonathan… I had the same question. I can imagine a smaller version would work great as a delivery system for grit or oyster shell for the hens. Mine get too much of the dust particles or get it dirty. I had used a rabbit feeder, and tried a small hanging feeder for oyster shell, but the girls kick bedding into both. And anything hanging makes me worried….except for the very heavy layer crumble feeder. The pipe has lots of potential for treat feeders, medicine dispenser. Hmm. A run on the PVC pipe corner of the store for sure! Love that feeder – very clever. I will be making one for my trio. Is the kelp for iodine? I’ve never been told that my goats need kelp. You are right Terry about goats brightening up any day! Such characters! That was adorable! Loved it! I just thought you should know that PVC is incredibly toxic and is banned in home building for water intake pipes (it can only be used for outflow). 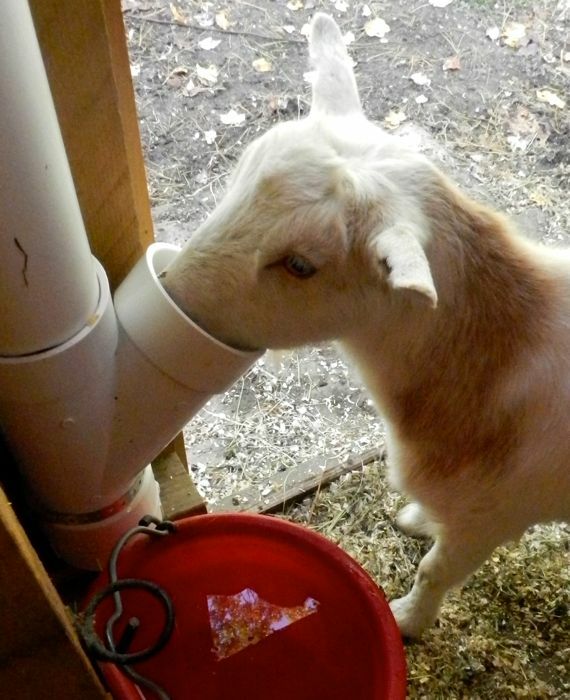 You may want to look into lining your pipes with something so that your goats aren’t endangered. Alice, thank you for this comment. The manufacture and disposal (especially burning) of PVC is a health risk, and so the decision to use this product (like so many) is a compromise. 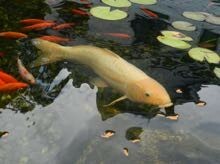 The use of PVC in a feeder is not as unhealthful for the animals as the use as a water dispenser. 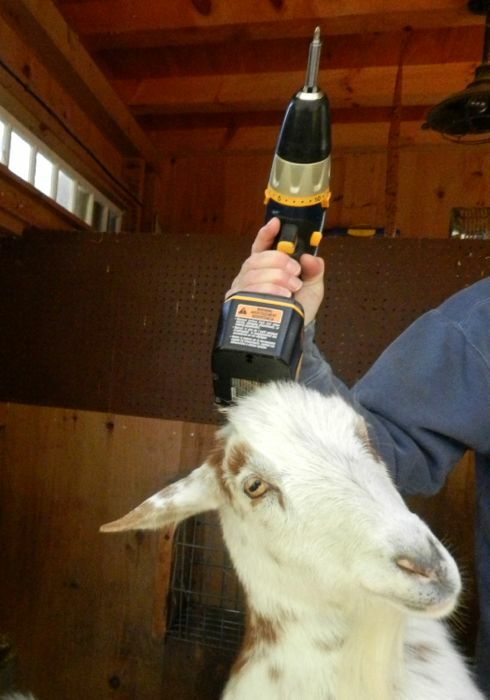 Ceramic, glass and metal dispensers are not options (dangerous in themselves for other reasons around goats.) So, for now, although not the ideal solution, I will use these feeders. What buckets, etc. do you use for your animals? The goatie boys are just wonderful. What an exciting time you have with them around. I do love reading your blogs about all the goings on!! Another option for them to take their minerals. These goats are very well taken care of. 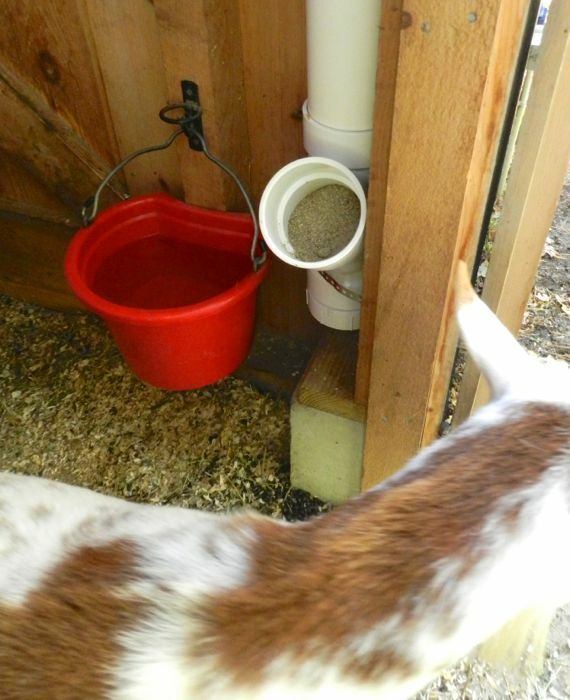 I’ve also seen goat owners use a plastic feed bit to dispense the mineral, soda, etc together. Really great photos of the boys. I so enjoy your goats (& bunny & hens). That’s priceless!! A picture is worth a thousand words. I made an identical feeder for my chickens (oops, I nearly said ‘chooks’; that’s what we call them here in Australia). Terry do you have a feed mill near where you live ? Because the person I follow who keeps two dairy goats gets her baking soda from a feed mill. I think she even uses it to bake with as well as giving it to her dairy goats. I know she mixes her baking soda with goat feed as well when she is milking them has it next to her stand so the goats can get as much as they desire. 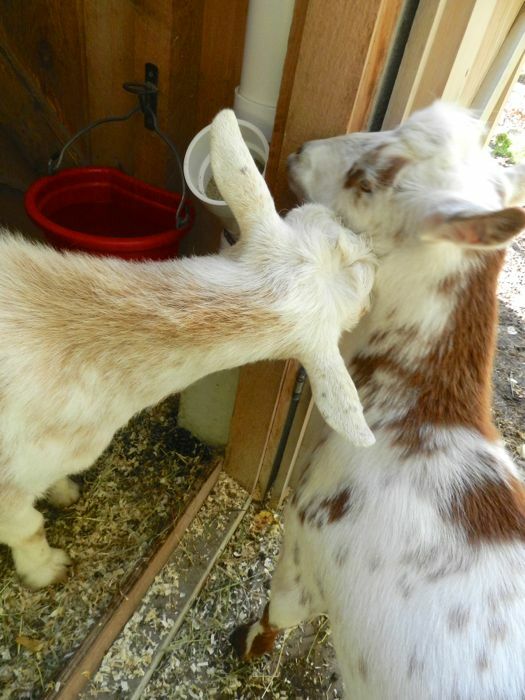 She and her husband recently built a key hole goat feeder, that only allows one goat to feed at a time so they don’t waste as much their hay as they use too. No feed mills here, Kit. I’m lucky to have feedstores nearby! Ah, looks like we’ll be making some too. We have none of that for our goats! I just love the pictures……they are so darn cute! My parrots have PVC stands. The guy that built them textured, twisted, and crimped the perches. We made a PVC feeder for our chickens in our temp coup. Since it is not that tall, we did the horizontal type that has big holed drilled in a row, and lies horizontally. 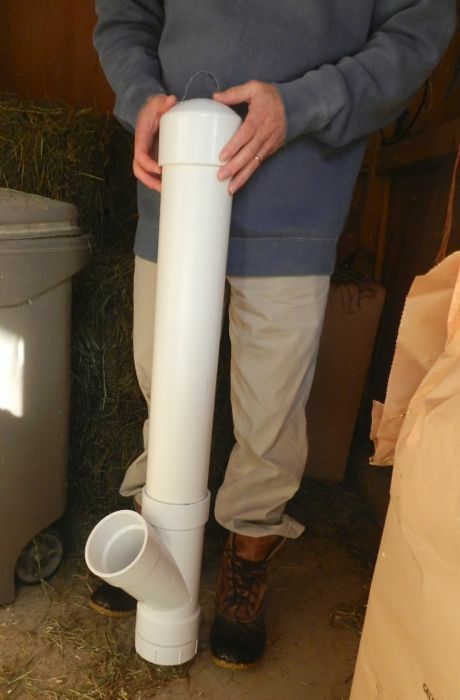 Even though we will have a hanging feeder like yours in the new coop (still waiting…) I’ll mount that small PVC feeder elsewhere to insure the picked-on hens can easily partake of their layer feed. Your goats are a joy! I don’t mean to insult, but sometimes their bellies look a bit, eh, pregnant. 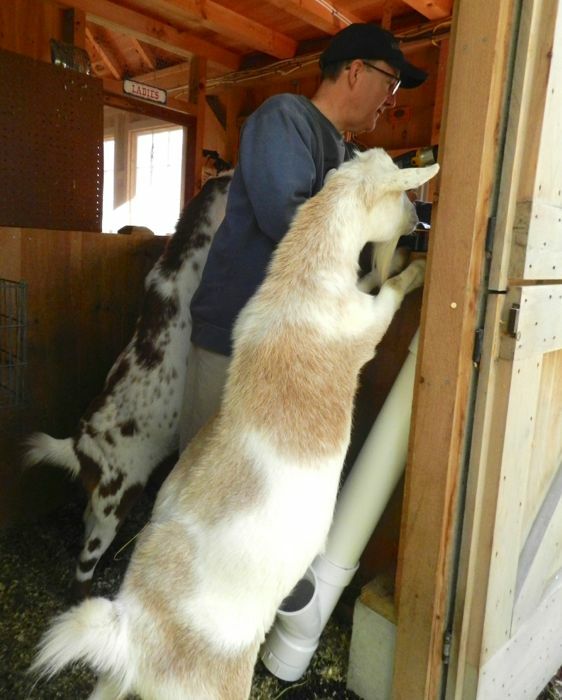 I love the photo of the goats “helping”, so adorable. The feeder seems to work really well, they certainly seem to like it. lovely post as always. I’ve kept a backyard flock for two decades and I’ve spent years researching chicken care and observing hens. I blogged about my life with chickens and what I’ve learned here for ten years. If you’re looking for advice about a specific issue, you’ll likely find the answer in an FAQ or by doing a blog archive search.